The fenders are seamless around corners, which improve protection, dampening and wear & tear characteristics. The seamless corners and customised fit give our fenders a sleek design. We offer different top-coats and the possibility for logo's to be crafted in to the fender. Each fender is tailor-made for the vessel and it's intended use.The fenders can be made in one piece at any shape and lenght up to 20m (longer upon request). We can deliver the fenders build from from a 2D cad, 3D cad or from a template for new builds and retrofitting. When no drawings are available we can measure the fender on location. By adjusting the parameters of the different materials the fender has an improved contact area and is higly adaptable to the hull shape and intended vessel usage. Our system offers a spectacular low weight alternative to normal fenders. The fenders are up to 12 times lighter than traditional rubber fenders. The light weight fenders will contribute to achieve the highest possible top speed. We also produce tailor-made fender systems for other applications such as fast, light weight workboats and windfarm support. 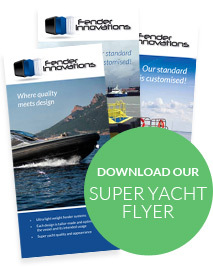 Are you looking for a new fender system or a refit for an existing superyacht tender? Contact us for information!